Gimatic S.r.l is a leading global manufacturer of pneumatic and electric grippers for industrial automation. Gimatic also designs and builds customized systems for clients' specific applications. Over time, Gimatic has grown the number of products it offers and, oftentimes, these devices must be updated, improved, or customized. The process of improving products can be expensive and time-consuming, and Gimatic has been committed to utilizing technology to reduce costs and streamline its workflows. 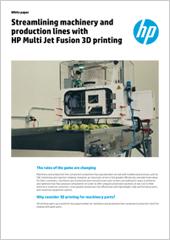 Download the case study to learn how HP Jet Fusion 3D printing solutions help Gimatic develop new products more quickly, gain speed-to-market advantage, and win more deals.